Show your support for our beloved mascot Wolfie Seawolf by voting online in SUNY’s annual Mascot Madness competition. 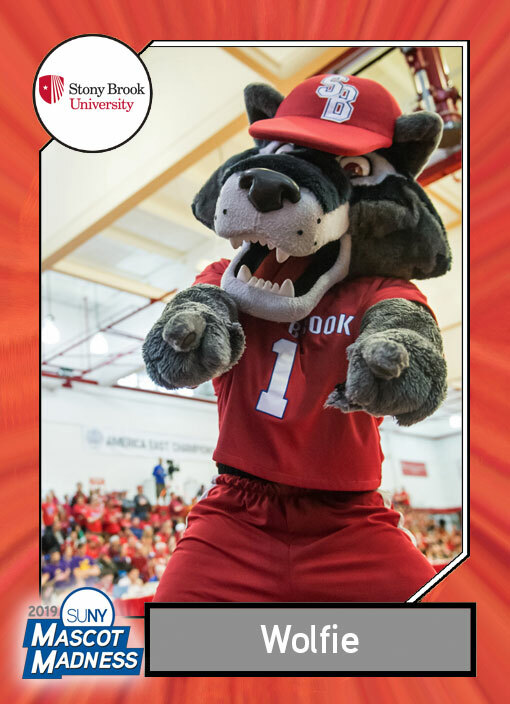 Cast your vote for Wolfie as New York’s favorite college mascot in each round. 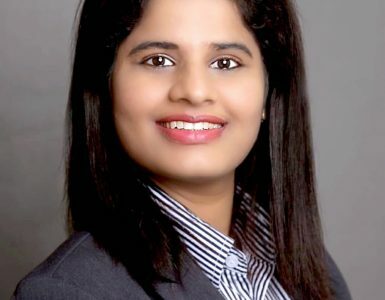 Voting begins on March 19 at 12 pm. 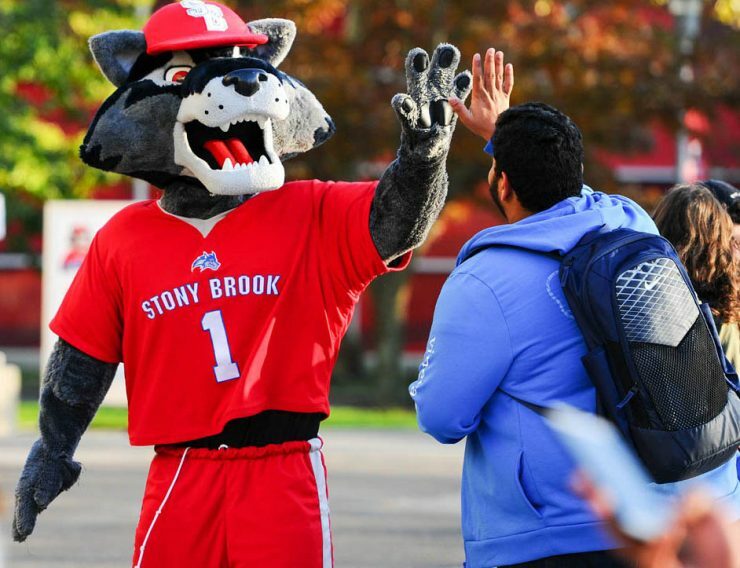 Let’s show the world that nothing beats Stony Brook pride! 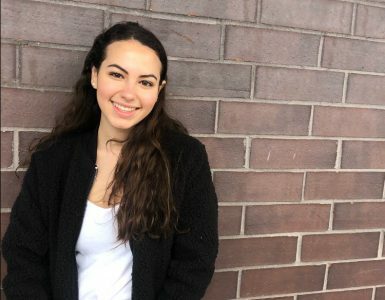 Who are you, where are you from, and who do you represent? 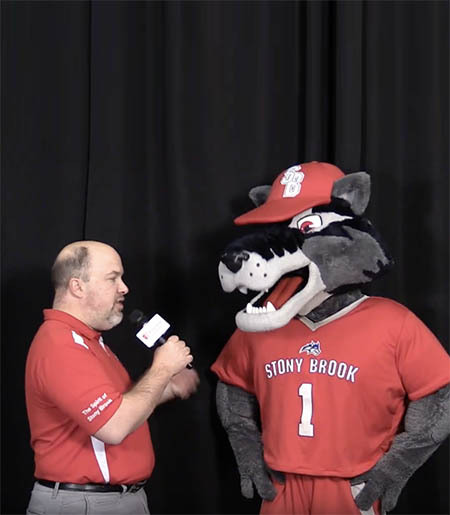 My name is Wolfie the Seawolf and I represent Stony Brook University. What is your wackiest attribute? The wackiest thing about me is that I’m always carrying a snack with me for those long days on the job. What would your autobiography be called and why? What is the biggest school victory/triumph you have been witness to? My favorite triumph was from the past season watching our women’s lacrosse team dominate the America East conference while also breaking NCAA records. Who is your on-campus partner that helps you stay on top of your game, the Robin to your Batman? I have 1000’s of on-campus partners. 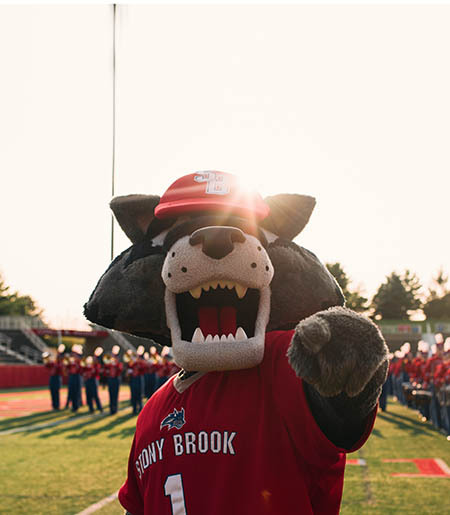 Every student and fan of Stony Brook is considered my “Robin.” All these students and fans are led by our amazing spirit squad consisting of band, dance and cheer. If you could trade places with any mascot for a day, who would it be and why? I would trade places with Sparky the Dragon of the New York Islanders. This way I would still be cheering for a local Long Island team. Plus he’s a dragon, and dragons are awesome. Should you make it to the finals, what would your entrance song be when you enter the final competition? What is your favorite series to binge watch? Teen Wolf because it’s about my good friend Scott. He grew up down the road from me. My app would be Seawolves daily. Everyday the app gives you a fact about what a seawolf is. For some reason people always ask me what’s a seawolf. 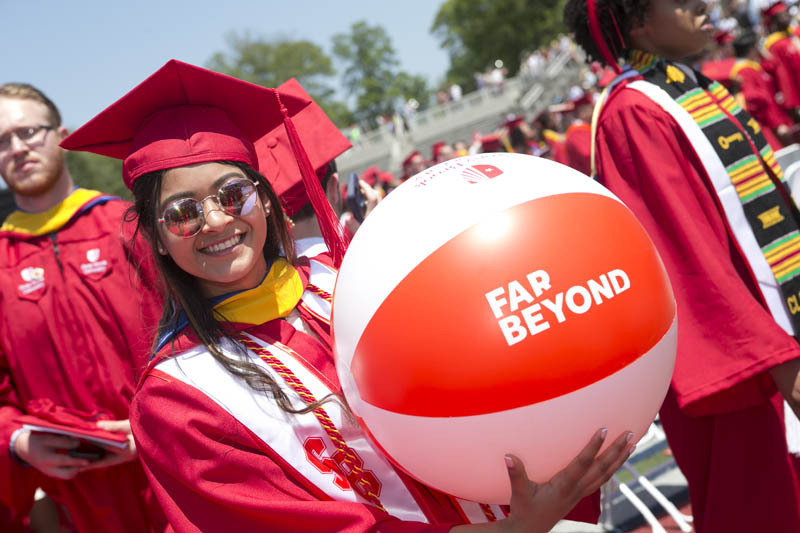 What one fact about your school do you love to surprise your fans with? Stony Brook has the only children’s hospital on Long Island. I regularly visit the patients there to brighten their day but also mine. This past basketball season each member of the team chose one child to honor at the game by wearing a jersey with the child’s name on it.